The best way to explore Lisbon! There is no better way to enjoy a city than riding a bike. In our tours you don´t need to wear Lycra to ride through the city, most people wear comfortable and relaxing clothes, it´s about getting to know new places while doing some workout. When we designed this tour we wanted it to be the most friendly Lisbon bike tour. 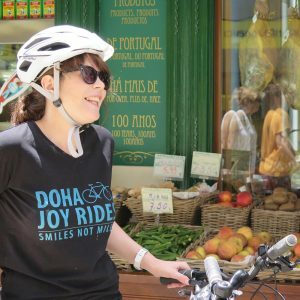 Cycling Lisbon will help you out offering the best, fastest and funniest way to get to know Lisbon with experienced and knowledgeable guides. Our Lisbon bike tour will take you to the traditional spots of the old city. 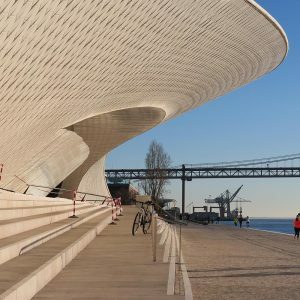 Cycling through the most fantastic and remarkable viewpoints of the city while you will be hearing funny episodes that will ignite your imagination about Lisbon’s interesting facts. As it was said by a Cycling Lisbon fan: “This tour is about smiles, not miles”. Even if you don´t have a lot of time for your Lisbon bike tour, you still have a great chance to see the city with our Lisbon Half day bike tour – ALONG THE RIVER AND THE MARKET that provides a 3 hour ride, covering Lisbon’s highlights and a break to chat with locals. You will get to know the activity of the traditional and main market of the city as well as tasting the traditional Ginjinha, a liqueur made of the local cherries. The bike tour ends in Belém which used to be the main gate for the loaded vessels coming into Europe. 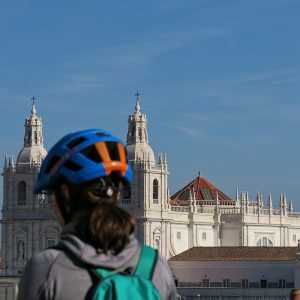 This Lisbon bike tour is certainly an exciting way of getting to know the highlights of the city while cycling from the old town to the discoveries district and along the river. Some people may call it cheating, we call it fun and no sweating! 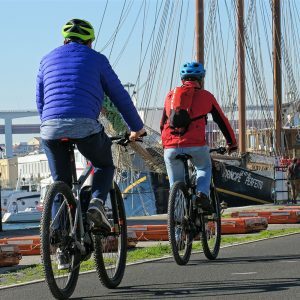 Lisbon e-bike tour – 3 FACES OF LISBON is a boost of fun for about 4 hours with our e-bikes through the fantastic main sights of the city, crossing the old part of the capital and all the way to the relaxing river ride. A bit before passing under the last Royal Palace (literally) you will wave to the Presidential Palace down in Belém district and soon after it will be time for what has been many times choosen by our customers as the most exciting part of the day: the delicious picnic and the ride through the main Park of Lisbon. But if you want to explore one of the best coast lines in the country, what about a FULL DAY TOUR IN ARRÁBIDA with an electric bike? This bike tour is the combination of a fantastic cycling route, through Arrábida roads with its clear turquoise waters and a swim or dip in the recently elected Best Beach in Europe 2017. Visiting one of the best markets in the world and touring a winery in one of the oldest wine regions in the country. Riding our super e-bikes to witness the contrast given by hills, castles, vast estuary, vineyards, fish market, all this so distinct and away from Lisbon’s urban rhythm. Our ventures are well suited for the riders who fancy a leisurely ride on two wheels. But if you wish to cycle and want to bring it to the next level, GO PRIVATE with us for a more challenging ride. Our guides are in pretty good shape! Let’s go on a Private Tour? 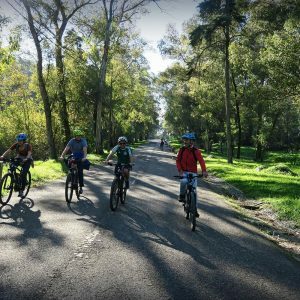 To go on private Lisbon bike tour with your group, on your schedule, you simply pick your date and ride, and we’ll do the rest for you. We offer routes for friends and family that play together and stay together. You can pick up ALONG THE RIVER AND THROUGH THE MARKET, CITY OF THE SENSES, SOUTH OF LISBON, LISBON GOURMET WALKING, and LISBON HIGHLIGHTS WALK, they’re unique, personal and all full of energy. There are many things in life that you can skip, but you can´t skip Portugal and its Capital. Lisbon is the best place to start your trip. 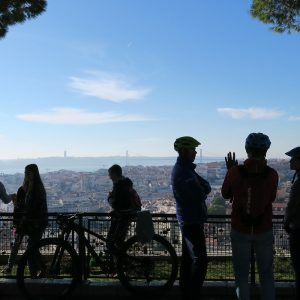 Do it cycling in a Lisbon bike tour to discover the city and realize how beautiful it is. The castles, as Castelo São Jorge settled in the heart of the city, the churches as Lisbon Cathedral, the delicious “Pasteis de Nata”, the neighbourhood “Bairro Alto” and its nightlife, the river, the people, the food, the hills, views, every aspect contributes to make the city really worthy to be explored.